Mehmet Aksoy was born in Yayladağ, Hatay in 1939. He studied at the Istanbul State Academy of Fine Arts, Prof. Şadi Çalık Studio between 1961 and 1967. He served as a teacher′s assistant at the Istanbul State Academy of Fine Arts between 1969 and 1970. He won a national scholarship and studied abroad between 1970 and 1977. Aksoy lived in London until 1972. He became one of the founding members and the president of the Berlin Turkish Academicians and Artists Association. In 1976 he participated in the Antalya Film and Art Festival with one of his sculptures, and put it at the town square for two months. 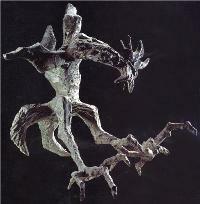 Aksoy worked in the Sculpture Department of Berlin Art School as a “mainstershule” in 1977. He also directed the Naizm Hikmet project while working as a freelance artist during the same year. He returned to Turkey in 1989. Aksoy’s works are primarily made in stone but he also incorporates other material, fusing metal or different stones into a single sculpture. He won the competition to participate in the Kranoldplatz Sculpture Symposium and completed the “Amorous Clouds” project between 1982 and 1986. He also won the competition to participate in the “Berlin Human Landscapes” Sculptural Symposium and completed the sculptural project “Work Immigrants” between 1984 and 1987. He finished “Our Dreams” project with the cooperation of Turkish and German youth, where he assisted young scholars in creating relief work between 1986 and 1988. Aksoy completed the stone project named “Cemal’s Dream”, which was erected in front of the Stedhaus Böcklepark youth hostel. In 1988 he made a monument to the World War II. Deserters in Bonn. In 1989 he participated to the II. Istanbul International Biennial with his work “Stories of Şahmeran”. In 1990 he participated in the III. International Asian-European Biennial and created the sculpture named “Separation” which was erected in front of the Istanbul Bebek Turkish Merchant Bank. He completed a family mausoleum project in the old cemetery at Karacaahmet. The monument he produced to the World War II. Deserters in 1988 was erected in Potsdam, Germany in 1991 in honor of those who refuse to fight in unjust wars. The figure in this memorial is carved in negative relief, a technique that Aksoy employed in his later work. The same year, he worked on the project, “Nature Mother” a sculpture made of natural rocks in Esenboğa in Ankara. 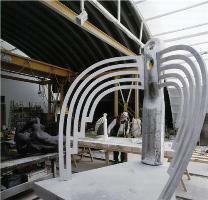 In 1992 he began the project “Sculpture under the Rainbow” to be erected in Altınpark, Ankara. In 1995 his sculpture entitled “At the Country of Fairies” was removed and his project “Sculpture under the Rainbow” was stopped by the Municipality for obscenity reasons. In 1995 his sculpture “Bull and Bear” was erected in front of the Stock Market. 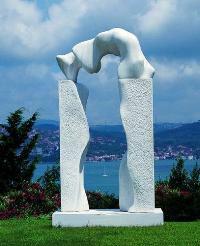 Aksoy completed “the Liberation Monument” in Selçuk, Izmir between 1995 and 1998. In 1996 he began a project in Pergamum on the highway junction, which is made of 300 tons of stones featuring a 17 m column with the image of Nike, the stones were transferred to Bergama, however the project was paused as a result of a change in the Municipality after the new elections. In 1998 Aksoy made a sculpture for the grave of Tuncay Artun in Boyacıköy. He completed the Presidential Hüber Palace IO Bosphorus, the sculpture of Ata and the Turkish War of Independence between 1998 and 2000. In 1999 he made a sculpture for the grave of Sıtkı Coşkun in Zincirlikuyu and Can Yücel in Datça in 2001. The same year he completed Iş Bank Towers’ “Cybele Fountain” sculpture. A 16m tall sculpture made of marble and metal materials named “the chief victory is peace” was constructed in front of the Iş Bank Towers between 2001 and 2005. The operations for the organization of the park and the environment are still continuing. 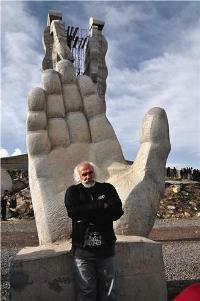 In 2002 he made a sculpture named “At the speed of a comet” for the grave of Berkant Aksoy in Ankara. In 2005 he created a sculpture in memory of the Native Indian Leader, Sting Bull. In 2005, a 30m long sculpture named “Do not let the mothers cry” was constructed on the hill across the Kars Castle and the operations for the organization of the environment are still continuing. His sculpture often contains sensual figurative elements, but he is strongly rooted in a modernist sensibility with strong conceptual and abstract elements in his work. He has received many awards including an outstanding service award from the Middle East Technical University (2004), an honored artist award from TUYAP (2008), Çağsav Ankart honorable award (2010), and an enlightenment award from the Atatürkist Thought Association (Atatürkçü Düşünce Derneği, 2016). Aksoy has held numerous solo and group exh ibitions in Turkey and abroad. He currently continues his work in Istanbul.